I got rained on for the first time the other day riding my bike to the beach. Definitely the first of many I think. I guess there are prices to pay when you live in Paradise! I only have a bike, so I ride it everywhere, including to and from work. Luckily I work in a kitchen with a bunch of sweaty guys anyway so it is OK that I show up drenched in sweat… Riding my bike has been a great workout for me though! I forces me to workout, which is perfect for my type of personality… 🙂 I know if that is not your case, it can be hard to find time or motivation to workout, I had the same problem. If that is how you feel, this is a recipe for you! Remember in my Detox Blueberry Fruit Smoothie post I mentioned the cleanse I did? Well here is the core of the cleanse- a mean, lean, green fighting machine. This soup is all vegetables and herbs blanched, then pureed into a healthy, low-cal, detoxifying soup. If you are not doing a cleanse this soup is delicious with salt, pepper and a little bit of parmesan cheese. It also makes a great snack to curb your mid-day hunger. If you are interested in the cleanse I did, it is a two-week cleanse that is much healthier and safer than some of the other cleanses. It was the MasterCleanse, but I didn’t buy the product. I just used the method that their cleanse uses; you being by cutting out one food group daily until you are only eating vegetables (the soup). You eat this soup for three days (as much as you want!) with lots of lemon water, then switch off days re-introducing each food group into your diet to see how it affects your body. Steam green beans, celery and zucchini until very soft, about 15 minutes. Add onion, spinach and garlic and cook for 5 miuntes. If you desire a very thick soup, drain excess water. Add parsley and basil and puree until smooth. Season with salt and pepper to taste. Wow, that sounds like a very interesting soup – I’ll be sure to give it a try sometime! The cleanse sounds interesting, what does it entail? Oh, I miss riding my bike! Right now I am looking out the window at a snow storm that hasn’t let up since last night. My bike riding days are far in my future. This looks like an interesting soup and certainly very healthy. What’s the name of the cleanse you are doing? It sounds like one that a few of my friends have done recently and they felt awesome afterwards. I really love that you posted this soup. I was into cleanses a few years ago and I used to do a four day fruit juice cleanse involving fresh squeezed juice for four days straight (and NOTHING else). I try to do them now, and I just can’t force myself to resist eating the things I make (since I went from vegetarian hollistic health nut to cupcake baking meat eater in a few years time). But…with that said, I would love to hear about the cleanse you did…maybe if it involves some cooking I could get more into it. I would love it if you e-mailed it to me. Thanks girl!!! I just love the looks and sounds of this soup. This looks great! I’m due for another cleanse. I’d love whatever info you are sharing. Thanks! This sounds wonderful. I have been thinking of doing a detox..
I’d love info on your cleanse. Would enjoy having copy of your detox cleanse. I’d love to have more information about the cleanse, please. Thanks for the soup recipe! Joelle, I tried e-mailing the cleanse info to the e-mail you provided, but it came back with a delivery failure. Please e-mail me at savourthesenses (at) gmail (dot) com if you still would like the cleanse stuff. Hi! Could you please send me information about your cleanse? This is the perfect soup for the coming early spring! Thumbs up. I’m not crazy about any kind of detoxing, but I do need more greens in my life. I just don’t eat enough. Thanks for stopping by the SD! This soup looks delicious! I’ve tried other “Detox Green” soups and felt great after them. Could you send more info on your cleanse please!? I would love information on your cleanse. Thanks for sharing! 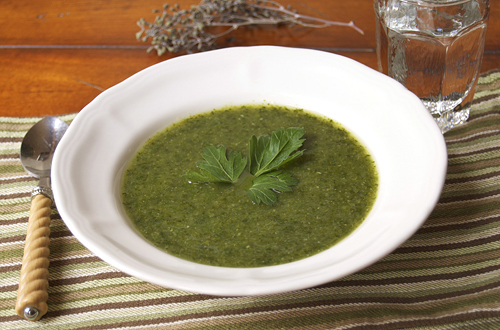 I love green smoothies, but have never made a green soup! I will be making this immediately. Could you please send me more info about the clense you did? Thank you! Will definitely make this soup tomorrow!! Green smoothies are my favorite, so I’m extra curious to try this. Could you please send me info on the cleanse? Thanks so much! this looks perfect! i was looking for detox foods when I came across this… if you’re still offering to e-mail info about the detox, I’m all ears. I would love the details of the detox. The blueberry smoothie and the soup look amazing! Great blog! I’d love to have a copy of the cleanse sent to me. Sounds interesting. Please send me some info on the detox. Hi, could you please send me the info about the cleanse you did? I am looking to cleanse, but can’t seem to find a cleanse that I can trust in. Thanks for the soup recipe! Made ir last night and it was great! Would love to have the info on your detox. Thanks! I would love a copy of the cleanse you did. How many pounds did you lose doing it? I would love to have a copy of the cleanse info!!!!!! 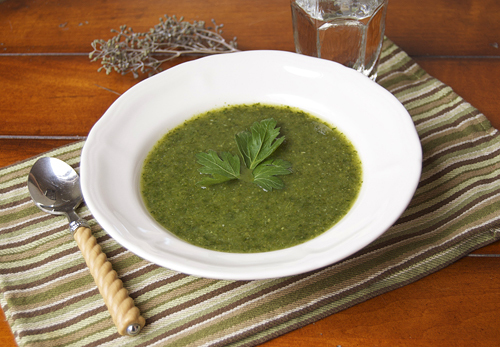 This Green Soup recipe looks fantastic, I’m going to try it tonight!! Please could I have details of your cleanse PLEASE!! Please send me your cleanse recipes. I am excited. I would love some information on the cleanse. I’m going to make this soup tonight. Hi Monique, sorry for the late reply, but please e-mail me at savourthesenses (at) gmail (dot) com and I can get that info to you! I am reading these old posts about the cleanse.If its not too much to ask, could you send me the cleanse? I would greatly appreciate it. Can you please send me your cleanse info. Hello, I would LOVE to try this out, but not with serving for 14 . Is there any chance of seeing a receipt for 4, or even 2 older people, one of them in very bad health. Realize that the posts and such are about a year old, but? Thank You very much. Jim and Linda of Simi Valley, CA. Hi, I just tried this soup today and just loved it. I am very interested in your detox/cleanse information if you are still offering. I look forward to hearing back. Delicious soup and will make again and again. Hi, I would like to find out more about the cleanse. Please send your detox plan mentioned in this blog (if you are still offering). Very interested. Thanks for the recipes. I would love some information on the cleanse! I am trying out the soup this week. Have a blessed day. I would love to have the information about the detox! Unfortunately, I lost the info when I got my new computer, but it is called the Master-Cleanse, but I didn’t buy the product I just used the methods that were used with their cleanse. Sorry about that! Do you add water to this soup? If so how much? I just used the little bit of water that I used to steam the veggies. If you want it thinner, puree and then add a small amount (about 1/2 C) at a time until you get the consistency you desire!